We are excited to now be offering gifts cards! Sold in the wine shop and perfect for every occasion, an Averill Creek gift card is the fastest, easiest way to gift the wine they want. Think birthdays, celebrations, holidays, or corporate gifting. If you or your gift recipient are unable to make it to the Averill Creek wine shop, you can purchase our online digital gift cards. Two Gold Medals at the National Wine Awards! We are excited to announce some outstanding recognition at the 2018 National Wine Awards of Canada. Our 2015 Somenos Series Pinot Noir and Charme de L'ile both received gold medals. This year, the awards received 1850 entries from 257 different wineries and seven provinces. Charme de L'ile is currently available in our winery wine shop, online store and at select private liquor stores or Save On Foods BCVQA locations. The 2015 Somenos Pinot Noir is available in our wine shop and online store. 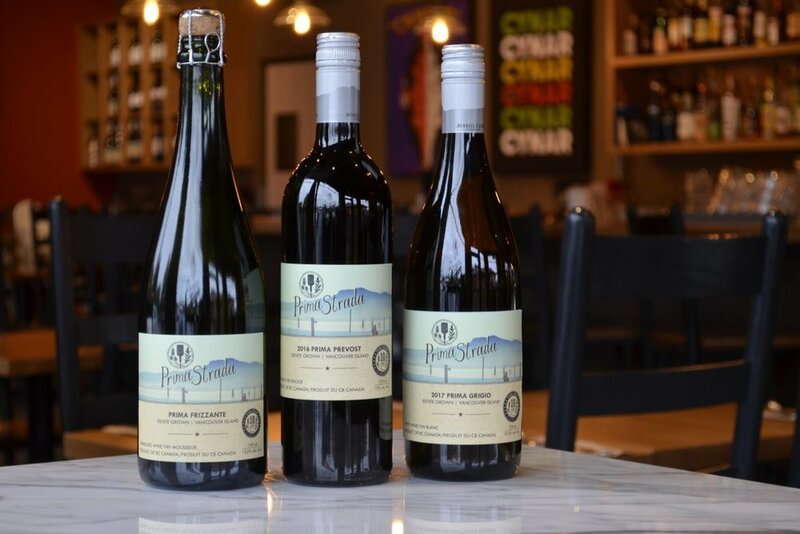 Pizzeria Prima Strada releases "Prima Frizzante"
We are excited to announce that our friends at Pizzeria Prima Strada now feature three Averill Creek wines in their Vino della Casa (house wine) family! The newest member of the family is Prima Frizzante, a Prosecco-style sparking wine. Be sure to also try the Prima Grigio or Prima Prevost the next time you stop in for some authentic Neapolitan style pizza at their Cobble Hill, Cook St. or Fort St. locations. Our 2014 Somenos Pinot Noir recently won a silver medal at the Global Pinot Noir Masters in London, England. Averill Creek Vineyard was the only Canadian Winery to receive a medal in this international competition. This follows the bronze medal that our 2012 Pinot Noir received at the same event in 2016. Acquiring, preserving, and making available records that tell our story - these records are preserved for our own use, for future research, and so that anyone interested in the story of Averill Creek Vineyard can access these sources.